Several years ago we were in the small village of Kalugumalai, in South India, when the villagers offered us some homemade soda. Silly me, thought, “How do they have a carbonation machine out here?” I figured they used some primitive way to add the carbonation. Our hosts spotted us drinking aforementioned soda, and anxiously urged us to stop. The soda was made with the unpurified village water, and even our Indian hosts didn’t drink it. I braced myself for the potential of a night taking turns squatting over the hole that was the toilet. But the grace of the universe was with us. No-one felt any ill effects at all. It wasn’t till several years later, when I discovered an interest in fermentation, that I realized the secret to the villager’s soda. 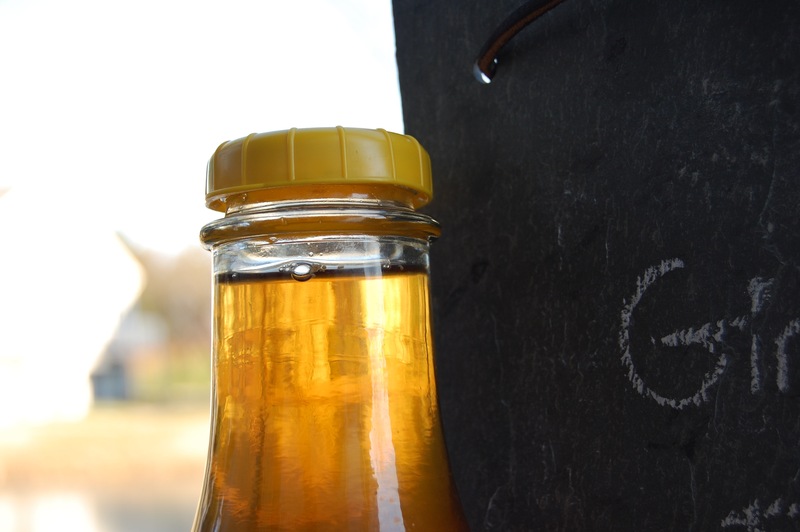 They had made it the way soda was originally made, before carbonation, back when soda was considered a health food. They had fermented it. Fermentation has the mystical ability to take yeasts out of the air, and transform sugar with lactic acid- hence the bubbles. No fancy equipment required. I don’t know what kind of herbs were in that soda, but they were probably medicinal, the way old sodas around the world used to be. The villager’s soda was also full of something magical: good bacteria, and it’s effects seemed to negate any hazards drinking the unpurified water might have. Now, I could never know for sure but drinking that soda might have been one of the best things we’d done for our health the entire trip. 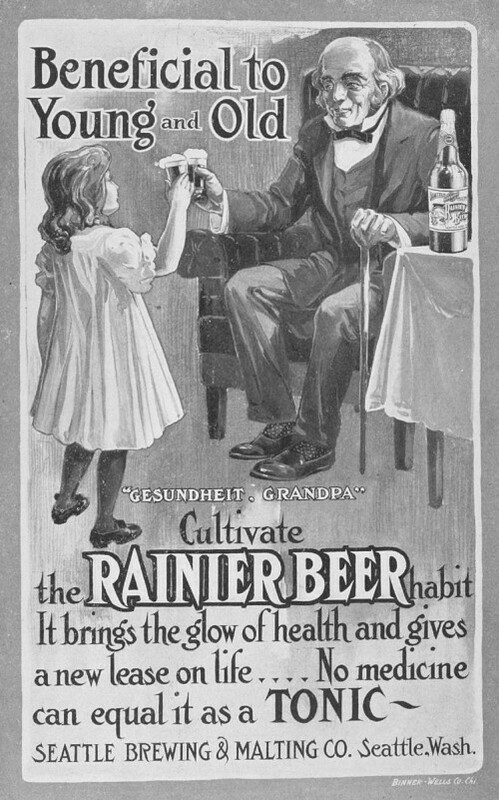 I was fascinated to learn that root beer, ginger beer, even hops brews, were originally medicinal drinks. Stephen Harrod Buhner’s book Sacred and Herbal Healing Beers is full of old time recipes like: root beer, birch beer, dandelion beer, elderberry ale, lemon balm ale, calendula ale, cider, and wild sarsparilla. The book talks a lot about the spiritual aspects of the plants and brews and their sacredness to indigenous cultures around the world. It also has a section on psychotropic and potentially deadly brews- not recommended to try! 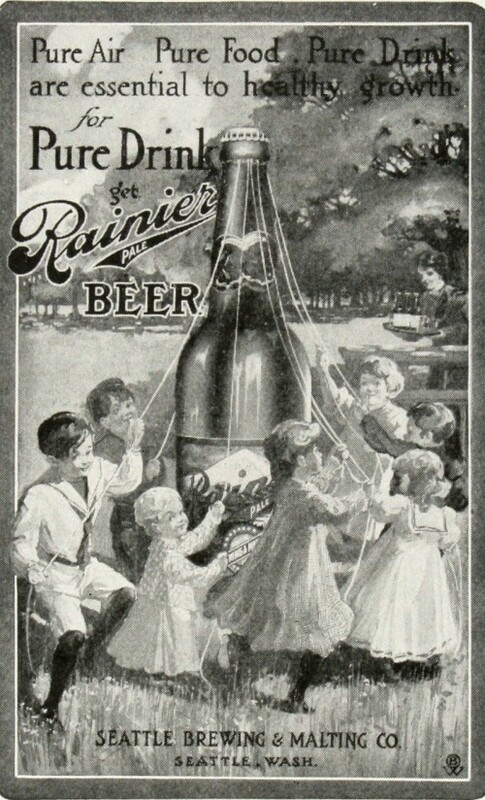 Here’s some old advertisements from the time when the beer/soda/medicine boundaries weren’t as clear- 1906 to be exact. I found them on Vintage Me Oh My’s blog which she found via the University of Washington’s Digital Collections. Check out her blog. She has the coolest vintage finds! And, just for the record- these pictures are for amusement. I’m not condoning giving children beer! Natural sodas please. And also for the record- modern beer & sodas are nothing like the old ferments! And I know nothing at all about Rainier’s manufacturing process! Most of the recipes in Buhner’s book use packaged yeast to kick off the fermentation, as do the recipes in another great and more kid-friendly book: Homemade Root Beer and Soda Pop by Stephen Creswell. It’s filled with great recipes I’m looking forward to experimenting with like: lemon-lime soda, cream soda, sarsaparilla soda, licorice root beer, mint-lime cooler, cherry vanilla soda, or ten-root spring tonic! I’ll be sure to update when I try some. Both of these books have Ginger Beer recipes. Although packaged yeast is supposed to give more consistent results, I’ve had a lot of positive experience with wild yeast. Not only have I used it to make Ginger Beer, but for making sauerkraut and kimchi. I learned from the book Wild Fermentation by Sandor Ellix Katz. I can’t recommend this book enough for all kinds of fermentation fun! It amazes me to to watch the process of invisible yeast helpers appearing out of nowhere and transforming my ordinary sugar/herb water into a bubbly, fizzy, delight loaded with B vitamins and good bacteria, just like I imagine the villagers did. 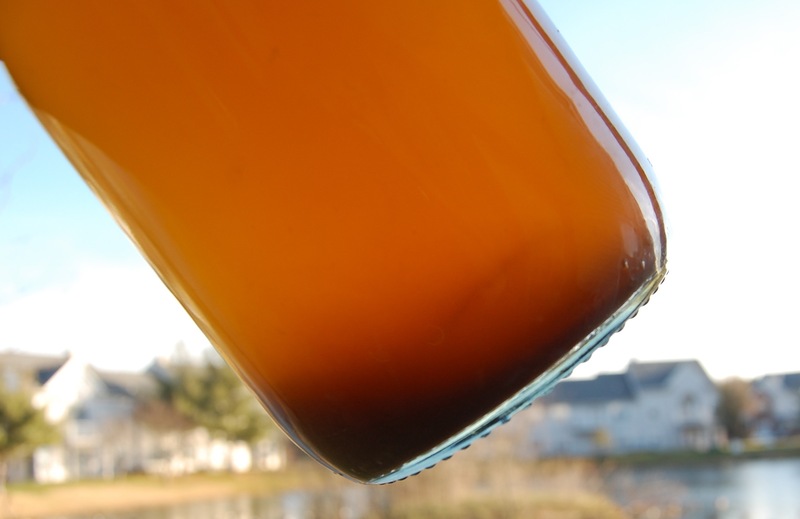 sediment that forms as ginger beer ferments- this is good for you! Ginger Beer only takes four ingredients to make and a little bit of time. Ginger, lemon, water, and sugar. I like to use sucanat (a sugar made of dehydrated sugar cane) in my Ginger Beer because it still retains some of the nutrients of the sugar cane. Ginger is warming and good for blood circulation. I really enjoy it in the winter when the outside world gets chilly and we’re fending off the cold. It is a powerful antibiotic, anti-viral, and anti-fungal, so anytime we feel the least bit sick it is one of our go to herbs. Use organic if you can, because conventional is heavily sprayed with pesticides. Chelsea Green Publishers, who publish Wild Fermentation, have the Ginger Beer recipe on their website. Or you can follow my summary below. Sterilize all the jars you will be using – there will be a gallon of ginger beer so you need enough sealable jars to hold that. 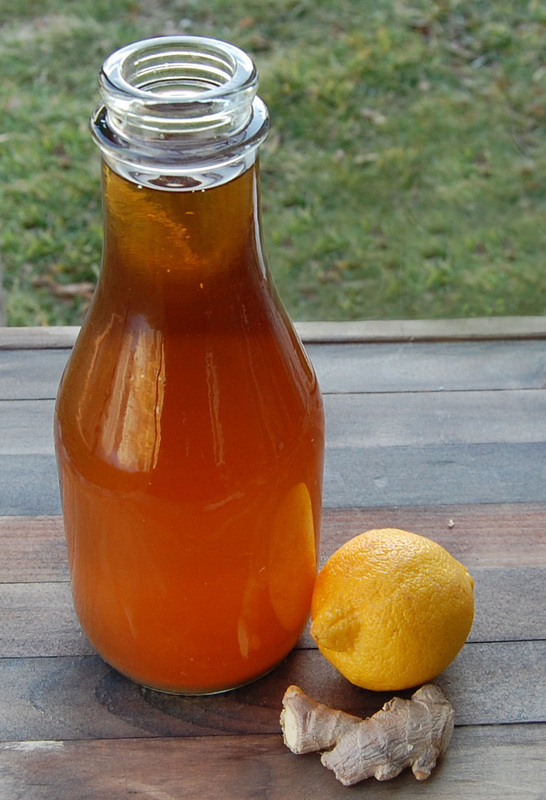 I’ve been using leftover glass jars from yogurt or milk, but you can use juice jugs or capped beer bottles. When I skip the sterilization with Ginger Beer, I get mold- and I could just cry pouring it down the drain. Grate 2 tsp ginger and add it to a jar with 1 cup of water (Use non-chlorinated water! Chlorine will kill the bacteria.) & 2 tsp sugar. Cover top of jar with cheesecloth or towel, and wrap it tight with rubber band. Let it sit in a warm spot for two days until bubbly. If it takes more than two day (it can take up to a week) add the same amount of ginger & sugar every two days until it bubbles. This is your starter. Now, boil 2 quarts of water and add up 2-6 inches of ginger depending on how strong you want your flavor and 1 1/2 cups of sucanat or sugar. Boil for 15 minutes. Let it cool. Strain out ginger and add the juice of two lemons. Add enough un-chlorinated water to make a gallon. Pour into sealable jars. Cap the jars. Leave in a warm place for 1-2 weeks. They will bubble. Put them in the fridge. Don’t wait too long to drink them- they are still fermenting and your glass jars may burst! This has never been a problem in my household because it never lasts that long. Now I just have to decide what I’d like to try next- thinking of heading to the home brew store to get some yeast! thank you for the interesting info and recipe. You’re very welcome- thanks for the comment. Good luck with all your soda experiments! love those bottles you used! I will have to get some & try your technique too, looks good!